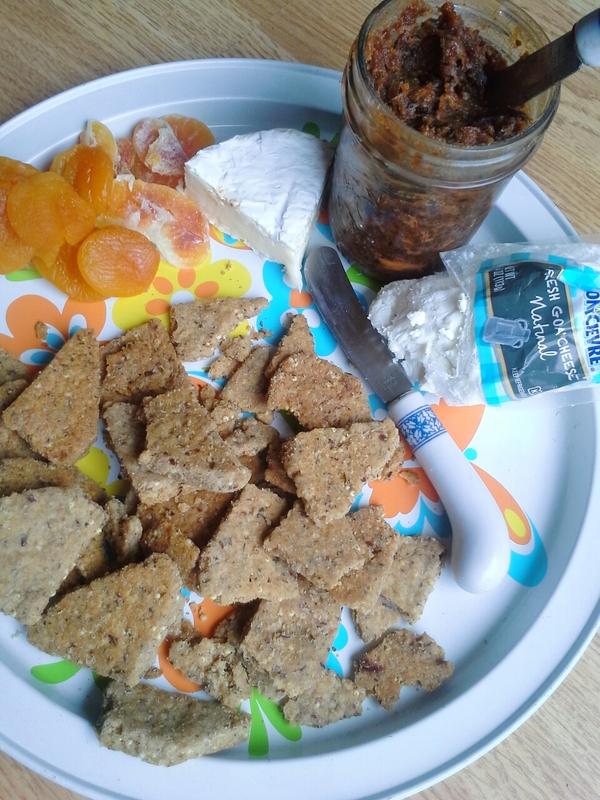 Though last week’s bacon jam has yet to meet a food it doesn’t improve, it was meant for a party and simply screamed to be partnered with goat cheese and homemade crackers. Which meant I needed to bring my cracker-making A-game to the kitchen. Past experience with DIY crackers has yielded tasty results, though the baked crackers always seem softer than what you’ll find in stores. I wanted crisp, so this seemed perfect opportunity to give cracker making another shot. The Homemade Pantry, Alana Chernila’s collection of all things DIY kitchen, was the book I turned to for my recipe. 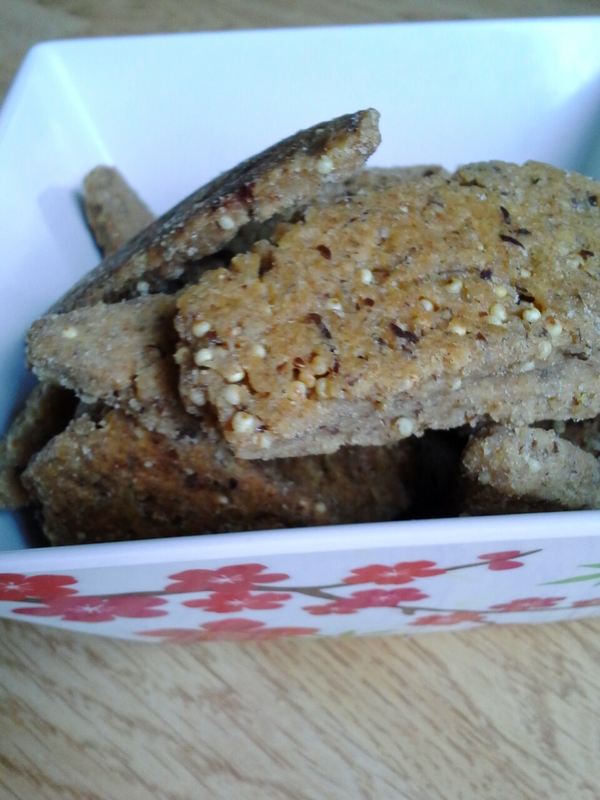 Her humbly named Wheat Crackers–basic and über-healthy–seemed just the thing to balance bacon jam. Ingredients were gathered and dough was made, rolled, and baked. I focused on rolling the dough to exactly the 1/8-inch thickness given in the recipe, as I’m guessing the softer crackers I’ve made hadn’t been rolled thin enough. Following Alana’s suggestion of adding garlic or rosemary to the dough would have given them more flavor; I’ll make this change next time. Still, these crackers were paired with that bacon jam, which has enough flavor for them both. If you’re reading this, my guess is you’re already on the DIY bandwagon, but if no, I encourage you to pick something–anything–and give it a shot. (Butter, for instance, is nothing more than overwhipped cream. You can make butter; no churn required.) If you’re well versed in from-scratch kitchen arts, would love to hear your stories. Please share in comments! Heat oven to 350°F. In medium bowl, combine flours, millet, flax, baking powder, salt, and garlic and rosemary, if using. Add oil; mix with fork. Slowly add water, mixing with hands as you go. Add more water (up to 1/4 cup) as needed until dough holds together. Knead in bowl 2 minutes or until smooth and workable. Transfer dough to ungreased baking sheets with spatula; sprinkle with salt and pepper. Bake 20 to 22 minutes, rotating baking sheets midway through, until crackers are hard to the touch. Transfer to wire rack to cool. Makes about 50 crackers. I need to check out the book! Would be nice to make my own Kahlua hehe. Woohoo! That is crackalackin! Liz, I have to confess that until right now I didn’t notice that your logo is an eggplant. Or perhaps I did but then forgot. Goooooo aubergine! deLiz is all about the eggplant, Dave. http://deliziousfood.com/ 🙂 Like I said, you inspired me with your crazy-talk Friday posts. Crackalackin’ is not mine, Mimi. Found it over @ BoFN in Dave’s Funny Names in the News (you know the ones where he’s frenetic and corybantic?). Do make them, then circle back. (put them on deLiz facebook 🙂 ) I like their slightly flaky crunch–they taste like a nutty, hearty, whole-grain pie crust. Thanks, Mimi! Thanks for your kind words, Steven. You seem to never run out 🙂 No airfreight and no Eatery, but I’m handing out the recipe! It wouldn’t take much to top my cracker-making skills–especially in the appearance department. That has not been my gift. (But I’m giving myself points for perseverance and pluck 😉 ) Always happy to have you here. Yes, the plan was to slow down a tad, but my company has asked me to write blog posts for their newsletter so I thought I’d add a couple of pertinent ones. I also write them when I’m travelling….fills in the time when sitting on a plane! First off, DROOL! Those look fantastic. Secondly, I love the comment you inserted in the recipe about the diamond shapes, caused a near tea disaster for my monitor. Lastly, the idea of adding rosemary, delish! Also, glad you caught the editorial in the recipe directions. Never sure how many people are actually reading the recipe. We will have to have these whenever it is that we all join up for the movie night. Surely they’ll go with at least one Hollywood Cocktail. I love it when people slip in humor where you don’t expect to find it. Regarding movie night, sounds good to me. Hey, thanks for coming by, amb. Especially on your big debut day! You better get serious with those (colored) markers and pencils and make yourself a crackalackin’ spreadsheet so you know when you’re going to be posting what where. Wonder how the crackers would be with a gluten-free flour. Would subbing in the gf flour affect texture? My 11-year-old daughter and I teach quarterly cooking classes at a local grocery store and we made muffins and DIY butter at the last one. Both the cooking school director and one of the students remembered making butter–just as you’d explained it–when they were that young in school. So, you, dear Beth, are making lifetime memories for these kids!! So awesome. Bet that butter would go extremely well on these crackers. !! Thanks for sharing, Beth 🙂 You teach at the coolest school ever: nap time has not been replaced by a college-level math class (or anything else) and also you work with lots of hands-on food prep. These kids are going to be in good shape! knew you’d be on board 🙂 Though your pantry staples are a cut above mine: flammkuchen? Awesome. Love that you put “make bacon jam” on your to-do list. Woohoo! I will have to try these crackers! The millet and flax seeds sound especially interesting. yes, I’ll go with your spin, Jenny. Thanks 🙂 Would highly recommend this recipe–crackers were a good texture, not too soft. Bacon jam?? Now I’ve heard everything. Sounds like some yummy stuff. It was a real eye-opener the first time I made my own crackers. They tasted so much better than any I’ve ever bought. Your recipe sounds much more flavorful than the ones I made and I really would like to give them a try. Thanks for sharing, Liz. agreed–eye-opening experience as it’s such a simple thing and only takes flour, salt, etc. The millet adds a great bit of texture–would highly recommend. Would love to to hear back if you make a batch. Thanks for coming over, John! Hope you circled back to the bacon jam as well as that seems your thing. the crackers are excellent solo, too. Or with cheese, hummus, bean spreads, etc. Love that you stopped by, Celeste. Thanks!! Ooh! I have always wanted to make crackers. This looks great! I love the wonderful bacon jam idea as well though I need tapenade! I too have suffered from my homemade crackers being soft. Each recipe I try (so excitedly!) has yielded rather sad results. I will have to give this recipe a try to boost my cracker confidence. 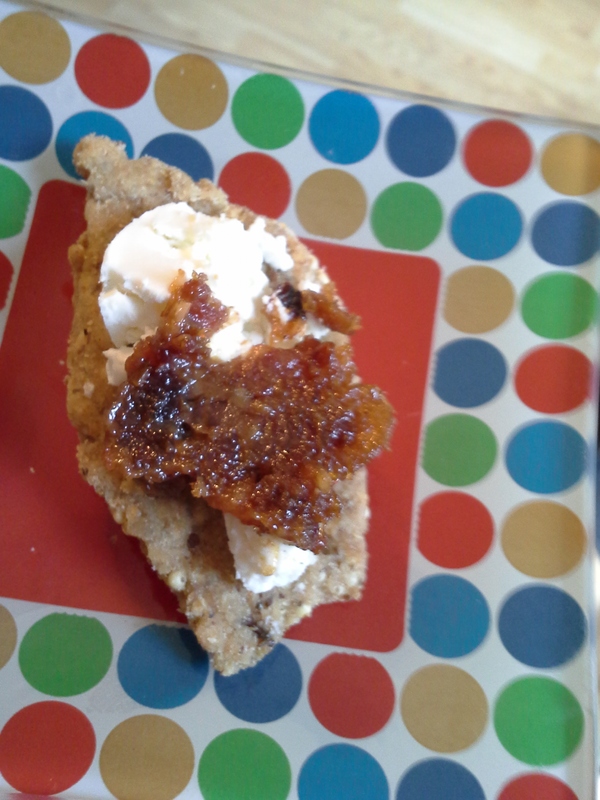 Looks super tasty with the goat cheese and bacon jam too! yum! you get it, then, J! 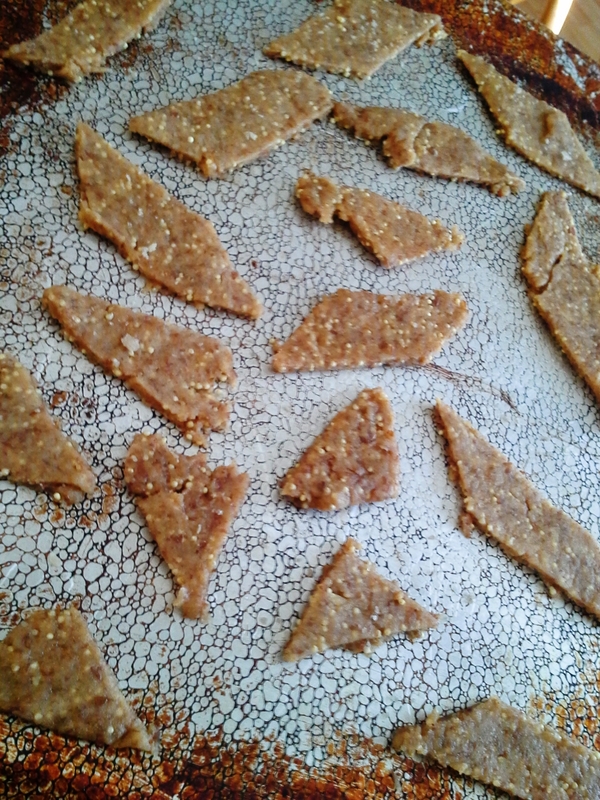 To make a batch of scratch crackers, then have them be breadlike….major disappointment. These were flaky and slightly crisp. Certainly not soft. And I liked that they had healthy ingredients: millet, flax, whole wheat flour, olive oil. Balances out the brie and bacon jam. Mmmmm,….your home-made crackers look so tasty & Yummy! 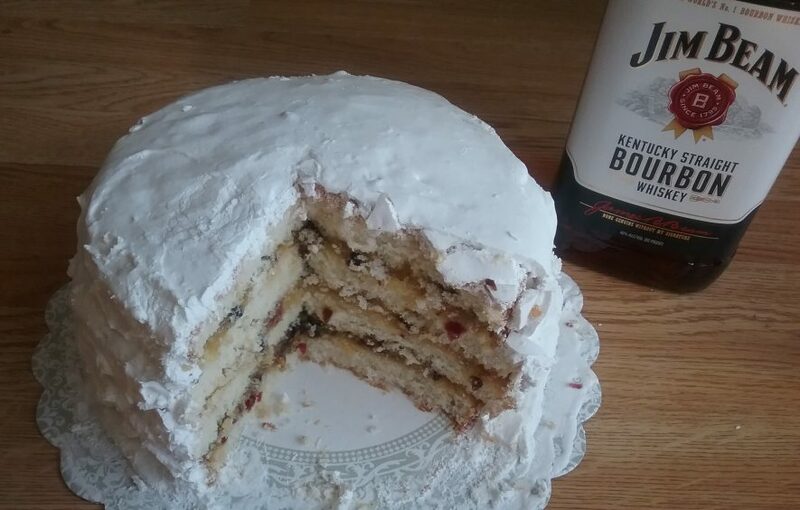 Another must make. Never made crackers! Never been that gutsy in the kitchen! Great crackers, I love, love, love DIY and really need to get the Homemade Pantry, its been on my wish list for a while! Love “crackalackin” too, great word! Seemed perfect for this post!